After the Citizenship (amendment) Bill, which is set to lapse on June 3, was not tabled in the Rajya Sabha celebrations broke out across northeast which had been vehemently protesting against it. The Citizenship (Amendment) Bill, 2019 provides for according Indian citizenship to Hindus, Jains, Christians, Sikhs, Buddhists and Parsis from Bangladesh, Pakistan and Afghanistan after six years of residence in India instead of 11 years, which is the norm currently, even if they do not possess any document. 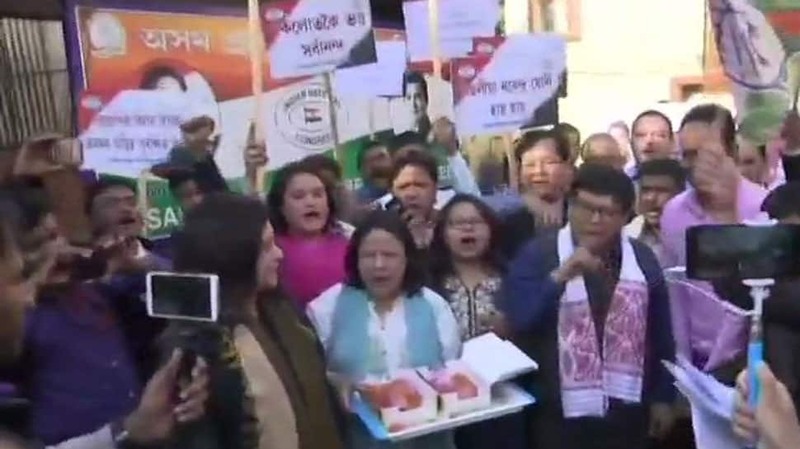 In Assam, supporters of various organisations agitating against the bill, which was passed in the Lok Sabha on January 8, were seen coming out to the streets, bursting crackers, sharing sweets and dancing. Congress leader Pradyut Bordoloi said the people were “saved today from the conspiracy of the BJP to destroy the people in the N-E region”. “This democratic momentum of the people has to continue against the communal forces,” he added. Tribal outfits and other organisations in the BJP-ruled Tripura expressed happiness on Wednesday over the Centre’s failure to get the controversial Citizenship (Amendment) Bill passed in the Rajya Sabha. Students’ organisations, political parties and individuals opposing the bill said the collective movement of all against the legislation had won. The North East Students Organisation (NESO) said the bill was not passed in Parliament since the people of the region and other parts of the country were united against it and supported their fight. “We got results in our favour due to a unified and joint effort of the people from north-east and other parts of the country. We are grateful to everyone who have supported us,” NESO joint secretary Upendra Debbarma told reporters. The NESO, an umbrella organisation of different student unions in the region opposed to the bill, had observed a bandh in the north-eastern states on January 8. “We are delighted. Due to the collective movement of various organisations and political parties, the BJP government had no alternative but to let the bill lapse,” Tribal Students’ Federation (TSF) general secretary Sunil Debbarma said. Sunil Debbarma thanked Congress president Rahul Gandhi, JD(U) chief Nitish Kumar, Shiv Sena supremo Uddhav Thackeray and other leaders for their opposition to the bill. State CPI(M) secretary Goutam Das said what happened in the Rajya Sabha was a reflection of the protests held in the region against the bill. He congratulated all the MPs for their role in Parliament. The scion of the erstwhile royal family of Tripura, Pradyot Kishore Manikya, said the nation had won over politics. “Jati jeeta hai, party hara hai (the nation has won and the party has lost). But we have to be cautious. If they are elected again, the central government might try to bring it back through backdoor,” he said in a Facebook post. In Mizoram, civil society groups and student organisations in Mizoram ended their protest. According to NGO Coordination Committee, an umbrella organisation of civil society groups and student bodies in the state, the scheduled rallies against the bill were called off on Wednesday after news of the legislation’s lapse reached them.